Jean Nicolet, a native of France, was the first explorer to reach the area while searching for the Northwest Passage to China in 1634. The French lost possession of Wisconsin and all of it's territories east of the Mississippi to Great Britain during the French and Indian War. British possession of Wisconsin ended in 1783, when Britain signed the treaty ending the American Revolution. Because the U.S. government had no effective control over Wisconsin, it remained under unofficial British control. Fur trade continued as the foundation of Wisconsin's economy. The first wave of American settlers in Wisconsin came in the 1820's as a result of a lead mining boom in northwest Illinois and southwest Wisconsin. The movement of white settlers into the Midwest caused intense conflict when the federal government and settlers attempted to move Native Americans from their lands. Federal policies included uprooting entire tribes and forcing them to resettle west of the Mississippi. When the Sac people tried to return in 1832, the Black Hawk War started ending in the Bad Axe Massacre with less than 1000 Native Americans surviving. Other Wisconsin tribes either left the area, or negotiated reservation lands. 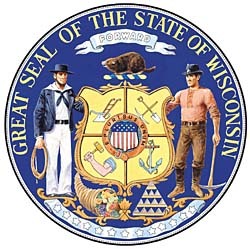 No longer having opposition from the Native Americans, a second wave of settlers came to Wisconsin and in 1836 the Wisconsin Territory was organized. Around the 1840's a third wave of settlers came to Wisconsin, attracted by good farmland. At that time the state became the nation's leading wheat producer. On May 29, 1848, Wisconsin was admitted to the Union as the 30th state.